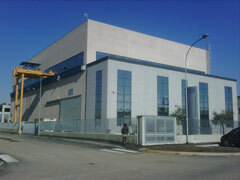 STEB is headquartered located in Brescia on 4.000 mq area. STEB has equipped with workshop for steel structural work, mechanical workshop and assembly workshop for site erection. STEB Structural work is equipped with cranes running at 15 mt height. The buildings are equipped with 4 overhead travelling cranes up to 100 tons lifting capacity. STEB Structural work is equipped with any type of machines, presses, welding machines(TIG-Summerged Arc Welder, wire weldings, etc..). 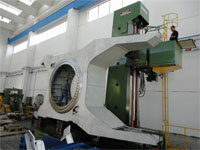 Metrosonic, magnaflux, penetrants cheks on weldings and materials are also currently made in STEB with the use of modern and updated equipments. Mechanical work is equipped with cranes running at 15 mt height. The buildings are equipped overhead travelling cranes up to 100 tons lifting capacity. The mechanical workshop is equipped with 3 boring machines numerically controlled suitable to machine pieces up to 13 mt lenght per 5,5 mt height, and many auxiliary machines complete the tooling up of the mechanical work. The STEB assembly work is equipped with cranes running at 15 mt height. The buildings areequipped with overhead travelling cranes up to 100 tons lifting capacity. The assembly work is provided with all necessary instruments for a proper and precise control inspection and erection of all the machinery and equipment made by us. The assembly work is fully staffed to carry outalso any kind of hydraulic and electrical testing.